What type of events are you suitable for? My music is suitable for a variety of events, particularly weddings and anniversaries, but also for private parties and corporate functions of all types. Bookings and enquires can be made simply by phoning or sending me an email. I’ll offer you a quote and, if it’s acceptable, send you an agreement and that’s it done! I don’t usually ask for a deposit although sometimes, if there are travel and hotel costs involved I might ask for those in advance. How long do you play and sing for? Within reason, as long as you like! Usually I’d play and sing for a maximum of three hours (excluding breaks) but I’ve been known to play for a lot longer! Two or three sets of up to one hour each covers most events, but I like to be as flexible as possible and can play for up to two hours without a break if it’s required. 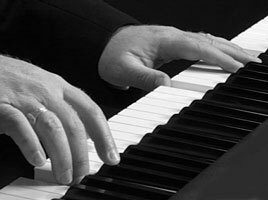 If you have a special song you’d like me to play, such as a first dance at a wedding, or other special favourites, I’m always happy to do that. However it’s always best to let me know what they are before the event so I can prepare accordingly. How much space do you need to set up in and how long does it take to set up? If I’m using my specially adapted baby grand piano, the ideal playing area would be not smaller than 8ft wide x 8ft deep (2.5M x 2.5M). If I’m using my digital stage piano I can get into a smaller space. I like to allow at least one hour for setting up and carrying out a short sound check. Yes, I carry Public Liability Insurance and all my equipment is PAT tested. Do you have any requirements at the venue? I need access to a mains power supply, a single power socket somewhere near the performance area is all I need. If possible, it’s nice to have access to a room where I can get changed and leave cases etc. If you would like me to perform outside I’d need to be on a hard standing (not the grass). That’s about it really, although a supply of soft drinks and the odd cup of coffee is always welcome.